Cannot recommend Real Donkeys enough. 2nd annual Seaside day for Nursery end of year event and 2nd year we've had Real Donkeys over. This year Karl brought Marley and Carl and they were all loved by all!!! Plans already in action for a bigger and better event to include all of the foundation stage children next year. Hired Real Donkeys for our special 25th anniversary summer funday last Sunday. The donkeys and their handler worked tirelessly for 3 hours and were loved by all the kids, not to mention the adults! Organising the visit was really easy and went like clockwork from start to finish. They even brought the sunshine! Real Donkeys were the star of the show at our school's annual Summer Fayre this year. Held on Wednesday 22nd June 2016, Walter, Tommy, Carl and Trooper won the hearts of our children, their families and our local community. We hope they become a permanent fixture going forward. Hired Real Donkeys for our school summer fair last weekend. They were brilliant! Booking was easy and all paperwork was sent through prior to the fair as promised. The donkeys were beautiful, very well cared for. Thank you Real Donkeys, the children really enjoyed your visit. I hired donkeys to come to our annual Notton Gala on 12 June 2016. Mike's employee Walter arrived on time with 2 beautiful donkeys that were clearly well cared for. Walter was lovely with all the children and clearly loved the donkeys and was very caring. The weather was terrible and unfortunately the Gala was cut short. I have already booked them for next year and would recommend them without hesitation. We hired 2 donkeys for my daughter's 6th birthday party on Saturday 26th March 2016. Tommy came with trooper and Danny 2 lovely pleasant donkeys and they stayed for 2 hours and came on time. My daughter and her friends all had many rides and got to feed and pet and fuss the donkeys which they loved ( so did the donkeys). Tommy was a lovely man who was available to answer any questions and couldn't do enough to help and please the children. 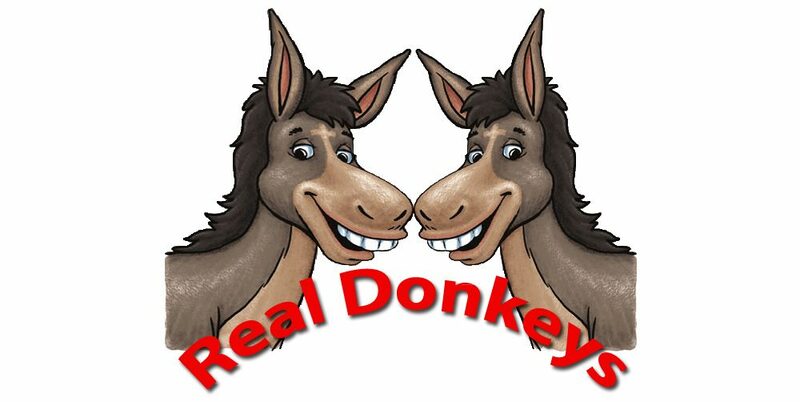 The price was very fair and I would definitely recommend and hire the donkeys again for a party. My daughter and her friends had a great time and so did I, thank you for this unique experience. Brilliant morning with Trooper and Danny (and, of course, Walter) at Saltaire United Reformed Church for Palm Sunday today. The donkeys were fantastic and we had lots of children in who were passing by as well as our own church family. The donkeys behaved brilliantly, not even put off by all the waving of palm branches. Many thanks to you all. Huge thanks to Mark and the donkeys for bringing lots of smiles to children and adults alike on Saturday 19th Dec. Our 'Nativity on location' at Wrenthorpe Mission was brought to life because of 'Real Donkeys'. They played their roles so well in delivering Mary and Joseph and the wise men to 'Bethlehem'. The children loved the donkey rides and adults as well as children really enjoyed feeding carrots to the donkey. Special thanks to Mark and his co-worker for going the extra mile in lending us and delivering bales of straw. Very much appreciated. Looking forward to making this an annual occasion. Have a blessed and well earned rest over Christmas.